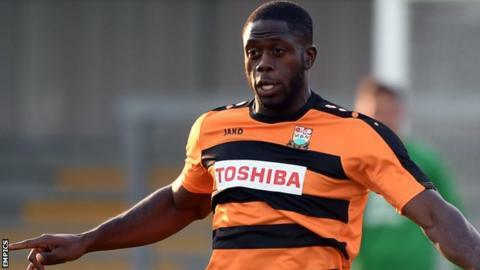 John Akinde scored twice as Barnet got their first points of the season with a victory over 10-man Northampton Town. The striker broke the deadlock from the spot, stroking down the middle after Jason Taylor saw red for fouling him. Akinde then rounded the keeper to slot home in the final minute, sealing the victory and ending Northampton's 100% start to the campaign. Bees defender Elliott Johnson had cleared a Lawson D'Ath header off the line when it was 0-0. "It was a close game, but the first goal is massive. If we'd have got it then we might have won tonight. "I didn't think the referee was great tonight. The 50-50 decisions weren't a 50-50 split. "No one questioned me changing the side when we beat a League One side 3-0 last week." Match ends, Barnet 2, Northampton Town 0. Second Half ends, Barnet 2, Northampton Town 0. Sam Muggleton (Barnet) is shown the yellow card. Bira Dembélé (Barnet) wins a free kick in the attacking half. Substitution, Barnet. Sam Muggleton replaces Curtis Weston. Elliot Johnson (Barnet) wins a free kick in the defensive half. Foul by Josh Lelan (Northampton Town). Goal! Barnet 2, Northampton Town 0. John Akinde (Barnet) right footed shot from a difficult angle and long range on the right to the bottom right corner. Corner, Barnet. Conceded by David Buchanan. Corner, Barnet. Conceded by Adam Smith. Corner, Barnet. Conceded by Ryan Cresswell. Attempt missed. Luke Gambin (Barnet) right footed shot from the left side of the six yard box is close, but misses to the left. Attempt saved. Andy Yiadom (Barnet) right footed shot from very close range is saved in the centre of the goal. Sam Togwell (Barnet) wins a free kick in the attacking half. Substitution, Northampton Town. Marc Richards replaces Sam Hoskins. Foul by Gavin Hoyte (Barnet). Dominic Calvert-Lewin (Northampton Town) wins a free kick in the attacking half. Goal! Barnet 1, Northampton Town 0. John Akinde (Barnet) converts the penalty with a right footed shot to the centre of the goal. Jason Taylor (Northampton Town) is shown the red card. Penalty conceded by Jason Taylor (Northampton Town) after a foul in the penalty area. Substitution, Barnet. Luke Gambin replaces Ben Tomlinson. Substitution, Northampton Town. Nicky Adams replaces Chris Hackett. Corner, Northampton Town. Conceded by Bira Dembélé. Ryan Cresswell (Northampton Town) wins a free kick in the defensive half.